Mix sugar, dark chocolate baking cocoa, powdered milk, and salt in a medium bowl until combined. Pour ½ cup cocoa mixture into the clear ball ornament using a funnel. Pour ¼ cup dark chocolate chips into the ornament. Pour ¼ cup salted caramel chips into the ornament. 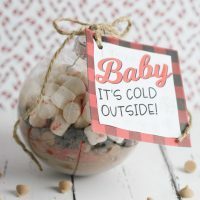 Fill remainder of space in the ornament with miniature marshmallows. Top with one tablespoon of red decorating sugar. Attach top onto the ornament. Print gift tags and cut out each tag. Punch a hole in the corner of the gift tag. Attach a tag to the top of the ornament using twine.